The Ropa vieja is, basically, the use of the meat that is left over from the stew. Today I present to you a very tasty and simple Ropa vieja that my mother made. 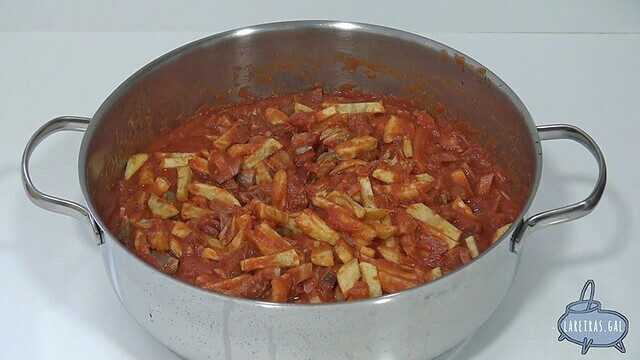 It consists, simply, in crumbling the meats, which can be pork shoulder, rib, chorizo ..., fry some potatoes and serve it all together with tomato sauce. If there are also left over cooked potatoes, they can be chopped and fry lightly instead of making new chips. I guarantee that it is delicious. Put to heat the tomato sauce. When the sauce is hot, add the shredded meat and potatoes. Stir gently, mixing well. Let it heat up together a few minutes.